The Dakota Access pipeline would carry oil from the Bakken formation in North Dakota to Gulf Coast refineries and export terminals via Patoka, Illinois. With a maximum capacity of 570,000 barrels per day (bpd), it could carry over 50% of North Dakota’s current oil production. Ultimately, the net greenhouse gas (GHG) impact of the pipe would depend on what future actions we take to end our fossil fuel addiction and address climate change. Building a large, new pipeline that reduces the cost of delivering a large oil reserve to market would undermine our climate goals. Meeting the targets set out in the Paris Agreement, now signed by over 180 countries around the world, will not be possible if we continue to lock into new fossil fuel infrastructure like Dakota Access. 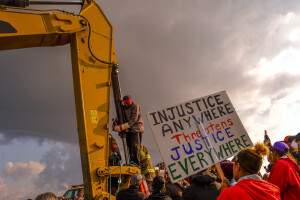 In response to the ongoing protests in North Dakota and the concerns raised regarding the approval process, construction of the project within 20 miles of Lake Oahe has been suspended, yet construction activities continue elsewhere on the route. The statement from the Departments of Justice, Army and Interior that ordered the suspension indicates that a review of the process by which the remaining permits can be considered will be conducted including “under the National Environmental Policy Act (NEPA) or other federal laws.” Given the White House recently issued guidance on how federal agencies should assess climate impact, it makes sense that a climate test should now be applied to this misguided project. How much carbon is in the pipe? The first response of pipeline proponents to estimates of GHG emissions from North American pipelines, will be to claim that the crude will go by rail if there are no pipelines. By asserting that the oil would flow with or without a pipeline, proponents will try to argue that the additional GHG emissions would be zero. This ignores both the market impacts of shifting from rail to pipe, as well as the potential for climate policy to alter the incentives for oil supply and demand. First let’s look at the difference in costs to shippers between rail and pipe. According to RBN Energy (behind pay wall), the Dakota Access Pipeline would reduce the cost of shipping Bakken oil from North Dakota to the Gulf Coast by $7 per barrel, with rail costing $15 compared to the pipeline charging $8. These are likely averaged tariffs and the difference may be greater or smaller according to specific contracts, committed volumes over non-committed, length of contract etc. This is a 47% reduction in shipping costs to the world’s biggest refining market, which nowadays also happens to be America’s main crude oil export point. There is no doubt that this is an attractive route for Bakken producers to get their oil to major markets at lower cost. And in an oil market that for some time now has seen prices hover between $40 and $50 per barrel, that $7 saving boosts profits and cash flow and can be put toward future investment in more drilling and more production. While the economics in the Bakken are very fluid, making it difficult to estimate with any precision how much more production is triggered by a $7 per barrel increase in netback, it is clear that it can only help producers. An extra $7 per barrel could be the deciding factor for whether it’s worth drilling a new well or not. A good example of the impact a similar increase can have was recently discussed by Bloomberg in response to a presentation by executives at Apache Corporation. In the presentation, CEO John Christmann explained how a rise in oil prices from $50 per barrel to $60 would enable Apache to drill over 3,000 more wells at its Permian Basin acreage in Texas, an over 300% increase on the $50 case. These figures may be unique to that acreage but it gives an idea of how an increase in the price a company can expect to receive from its operations can enable it to drill and produce more oil. Another respect in which pipelines impact climate compared to rail is that they lock in oil supply, because they have a higher ratio of capital expenditure (capex) over operational expenditure (opex). 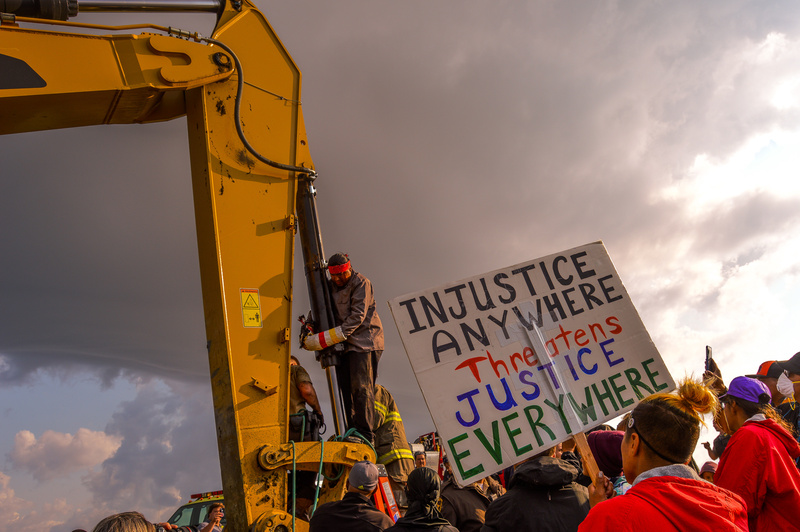 The Dakota Access pipeline is estimated to cost $3.8 billion. In addition, the ETCO pipeline, which is the southern section of the system that would deliver the crude from Illinois to Texas and is mostly comprised of an old gas pipeline, will cost around $1 billion. All together that’s a $4.8 billion investment. Shutting down a $4.8 billion pipeline investment before it’s paid off is rare. If markets change due to climate policy, perhaps because of new policies that reduce oil use, or rapid market adoption of alternatives such as electric vehicles, companies are likely to keep the oil flowing by cutting tariffs. As long as tariffs are higher than the operating costs of pumping the oil, any capital losses for the pipeline owners will be reduced, and any long-term profits increased. So in the climate-action scenario, the tariffs could go a long way below $8 – perhaps as low as $1 or $2 per barrel. This will have a powerful effect in maintaining oil flows – and hence emissions – in spite of future climate action. In contrast, rail terminals are comparatively cheap to build. A rail terminal built to load or unload crude onto and off of rail cars typically costs in the tens to low hundreds of million dollars to build, depending on the size. The capital is paid off quickly but the operational expenses are higher. The reason sending crude by rail is more expensive than pipeline, $7 per barrel more expensive in the case of the Dakota Access, is the cost of running the operations. Loading and unloading rail cars, paying rail company freight charges, fuel surcharges, insurance, transporting the crude to and from the rail yard, all of these make rail transport an opex-intensive activity. In contrast to the pipeline, rail operators cannot significantly lower their tariffs, because operating costs are the dominant part of the economics. The recent price crash illustrates very well the role of pipelines in maintaining high oil production during times of tight margins. If rail had been the only option, some producers would have shut in wells as their operational costs, including sending the crude to market, would have exceeded the price they received. Because pipelines existed as an alternative, existing pipeline capacity filled up instead. Nobody wants to see a decimation of an industry overnight, with the severe consequences for workers and communities that that entails. But it is a fact that we need to transition to a clean energy economy as soon as possible in order to address a climate crisis that itself will decimate communities and ecosystems forever. By continuing to build infrastructure that perpetuates our use of fossil fuels for decades to come, we are laying the foundations for disaster and not transition. The Dakota Access pipeline would be with us decades into the future. Once built and operating the economic incentives to keep it going will be hard to overcome. Every year it will be the source of carbon emissions equivalent to nearly 30 coal plants. Even though it may be the case that those emissions would anyway occur this year or next year, or five years from now, it cannot be the case that those emissions can occur in 20, 30 or 40 years from now. Building Dakota Access would be yet another barrier to the path to climate safety. 1: We used the Oil Climate Index for the life cycle emissions of Bakken crude oil and the EPA Greenhouse Gas Equivalencies Calculator for coal plant and vehicle equivalents. 95% utilization equates to average annual throughput of 541,500 barrels per day. Contact us for full details of this calculation. Heartfelt thanks for this very clear, helpful article. There are so many reasons not to allow this pipeline and this is certainly one of them. Someone asked Obama or the next guy to Stop the DAPL now!…. Our Native people believe in preserving mother earth. Seems like Washington is Avoiding this action and why. Money is not everything. According to my calculations the 1200 mile 50 foot wide pipeline right of way would produce several times as much energy if covered with solar panels instead of used to ship oil. It would be cheaper too. This pipeline will raise prices, in crease exports, and only massive 5.3T$ gov breaks for fossils (imf) keep it alive. I think that it is inexcusable that the “greens” are using the American Indians as foils in their battle against affordable American energy. Thanks to fossil fuels the poorest people in America can enjoy living in comfort as only the rich of prior generations did. Old widows on pensions can live in an environment of 72 degree comfort because of inexpensive fossil fuels. That is the environment real people care about. This article treats the transported oil as if it were a product of the pipeline itself, when in fact it is currently being delivered by other means, eg, railroad cars, a far more risky and inefficient means of delivery; and as if it will not offset other fossil energy sources, eg, foreign oil delivered by sea-going supertankers, or domestic coal. Using the same singular logic, I would argue that the oil could enable the closure of “29.5 typical coal plants coal-burning plants”, with a net CO2 reduction of approximately 25 “million metric tons of CO2e per year”. Of course, that’s at 95% capacity; any less and the reduction goes down. How many long-term jobs would the pipeline ensure? How many long-term jobs would rail transport ensure? I thought that was the point of Trump’s America First theme. If this oil is meant for export where is the America First? Lottie: How you have sinned by saying money isn’t everything! When it comes to transporting oil, why does no one ever mention Co2 emissions? I get that oil use is bad, but what makes transporting the oil we use, and will likely continue to use even if its a very small amount, by pipeline? Doesn’t pipeline transport beat out rail transport by a wide margin when it come to emissions? We develop public transit to replace individual transit to reduce emissions, but when it come to oil transport you would rather see it transported by rail? I get that rail has a higher cost and discourages production, but you could simply tax oil consumption and achieve the same effect via “climate policy.” No solution seems possible that doesn’t reduce demand for oil. So why endorse rail transport at the cost of increased co2 emissions?